We’ve been hard at work rolling out a number of new features over the last few months, e.g. 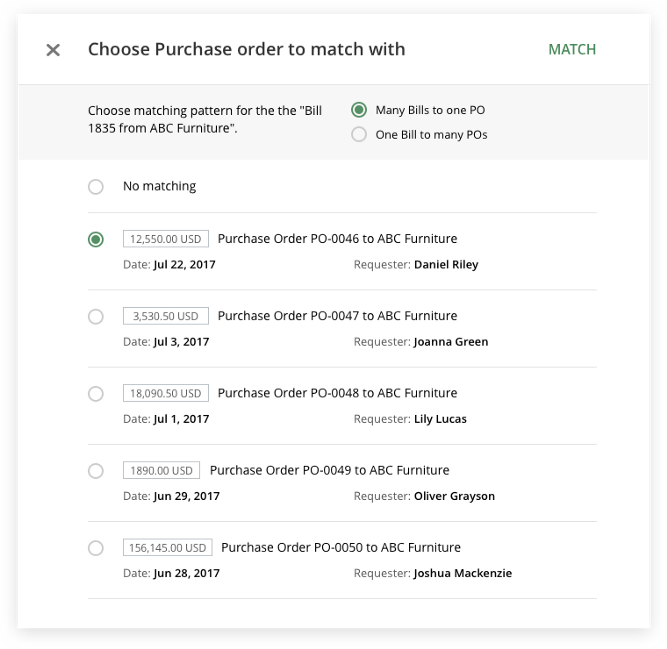 Bill Accrual Reports and Bill to PO Matching, in order to make our users’ lives easier. 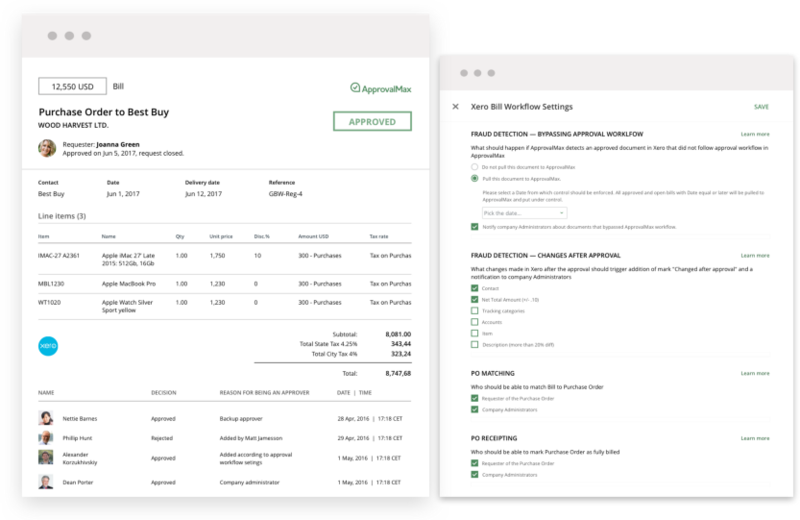 These new features, together with the key workflows of Purchase Order Creation & Approval and Bill Approval, now support an end-to-end the purchasing process for companies using Xero. In this post, we’ll introduce you to ApprovalMax’s Purchasing Solution, which has been designed to simplify and automate purchasing, establish finance control, and foster regulatory compliance. Thanks to the poor definition of spending roles, purchasing roles, and authorisation limits within organisations, and difficulties reconciling Bills and Purchasing Orders, we were inspired to implement our own purchasing solution. These challenges are joined by a lack of audit trails for POs and Bill approvals, and a need to take both Requesters and Approvers out of the accounting software. Purchase Order creation in ApprovalMax > PO approval and its submission to the supplier > Matching of each Bill with the corresponding Purchase Order > Bill approval. 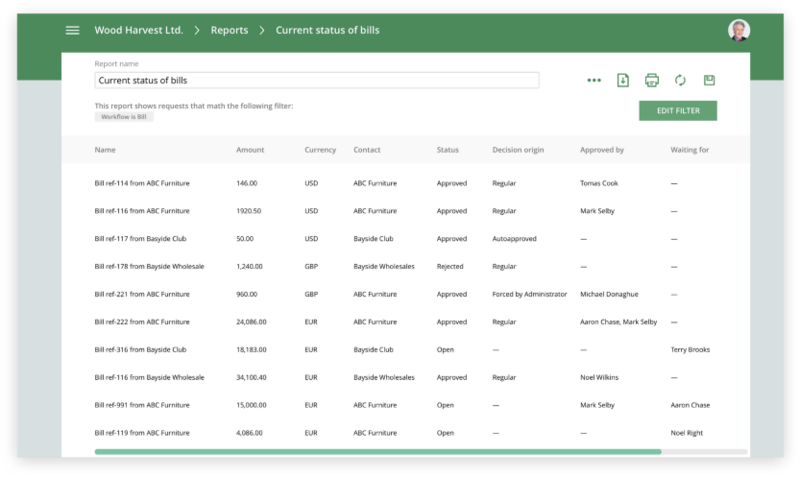 Xero is extended with sophisticated review and approval workflows which enable conditional, sequential, and parallel approvals, as well as a flexible definition of authorisation levels, e.g. spending limits or cost centres. Bills can be manually matched with the corresponding Purchase Order(s), and reviewed and approved based on the matching. The amount check capability verifies that the total Bill amount does not exceed the amount of the initial Purchase Order(s). 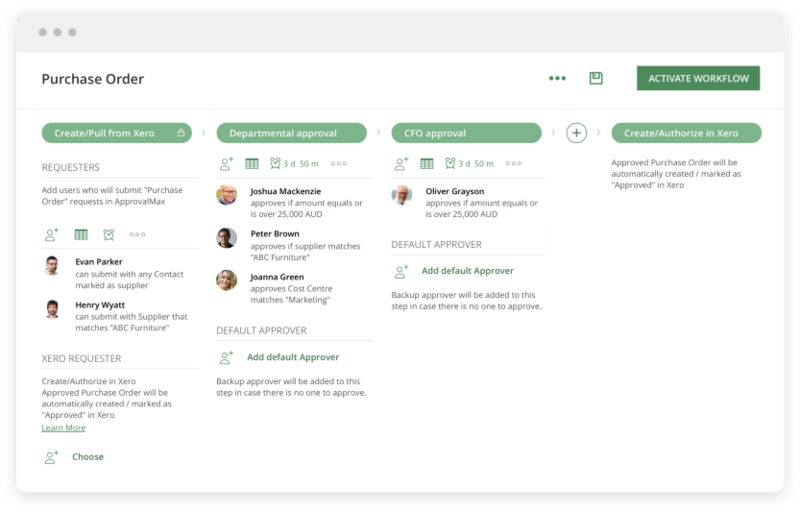 Automatic notifications for Approvers as well as real-time report views of the approval progress and the received invoices help identify any bottlenecks, discrepancies, or delays in the review and approval process. A detailed and precise history of all approval decisions is provided for audit and compliance control purposes. Upon the final approval, an audit report based on the audit trail logs is created to enable tracking of all key approval decisions, ensuring audit readiness at any given time. Purchase Orders are created and approved in ApprovalMax and then sent to the supplier automatically; a copy is created in the Xero accounting platform. On receipt of the supplier’s invoice, a Bill is generated in the Xero accounting platform; either manually or via an OCR system. The Bill is then routed according to the workflow settings and assigned to the appropriate manager holding the proper authorisation level. Manual matching of the Bill with the corresponding Purchase Order(s) is done. The amount check is performed to make sure that the total amount of the Bill does not exceed the amount of the initial Purchase Order(s). Once approved via the web or native mobile app, the Bill is assigned the status “Awaiting payment” and the accountant is notified about its approval. Finally, an audit report for the approved Bill is generated, including the Approvers’ names, dates, etc. With its easy-to-set-up workflows and clearly defined purchasing steps, roles, and authorisation limits, ApprovalMax’s new purchasing solution gives you tighter control over spending. Everything is reviewed and all approval decisions are audit-ready and fully compliant. And thanks to the fact that Approvers and Requestors no longer require access to the accounting software, data security is heightened. And if you’re not currently benefiting from ApprovalMax, find out more about the platform and its other capabilities by clicking here. Or if you’d like to try it out, sign up for your no-risk 30 day free trial here.